The Korean mobile phone company, WND has recently introduced its new and innovative dual SIM cards cellphone, named as Duo Atom. You might ask, “dual SIM cards handset isn’t exactly new and what so special on the Duo Atom?” This high end cellphone is so special and cool with its built-in gravity sensor which able to switch your service provider in more convenient way, seems perfect for folks who always travel internationally. To switch between the two SIM cards, you just have to rotate the phone 180 degrees and the gravity sensor will detect the change in orientation, and then automatically reverses the screen and keypad to the other network service provider thanks to its unique TouchPad application. In addition, the key features of Duo Atom include its integrated 3-megapixel auto-focus camera, 1.8-inch TFT screen display (resolution of 176 x 220 pixels), TV out, bluetooth 1.2 with A2DP and USB 2.0 connectivity. With WND Duo Atom dual SIM cards handset, the users are also allowed to manage both personal and business community without having to carry two phone. 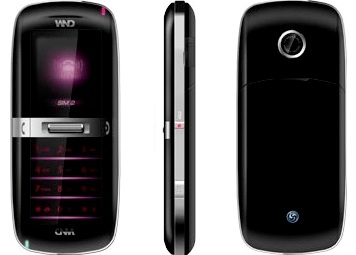 The new WND DUO Atom mobile phone which measures 109x48x14.5mm is expected to be available soon but no words on its price yet.